The Dubai Downtown has become lively with the establishment of the Burj Khalifa but is made livelier with the captivating performances and the sheer magnanimity of the artificial Burj Khalifa Lake. The popularity of the Burj Khalifa Lake is however because of the presence of the world largest light and sound fountain, known to all as the Dubai Fountain. The Dubai Fountain is a part of Burj Khalifa and a section of the Dubai Downtown redevelopment project undertaken by the government of the United Arab Emirates to up the popularity of the Dubai City in order to better the trade connections. The Fountain was inaugurated along with the Mall in 2009. The Dubai Fountain is the world’s largest performing fountain built by the California based company WET Design, responsible for giving Las Vegas many beautiful choreographing fountains. 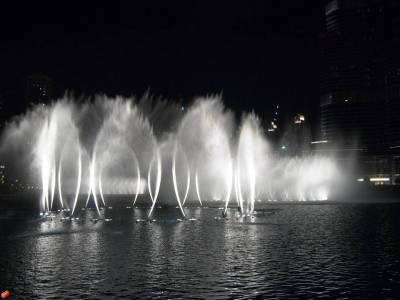 The performance that the Dubai Fountain presents is a mesmerising marvel that every person wants to witness. The Dubai Fountain is the greatest attraction of this part of Dubai Downtown aside the Burj Khalifa. The crystal watered lake with a performing fountain creates an ambience that is very tempting. Tourists from all over the country and all across the globe find it hard to resist the heavenly performance of the Dubai Fountain. There are more than 6500 lights and about 24 to 25 colour projectors in the fountain system stretching over the lake for about 75 metres in a unique pattern. 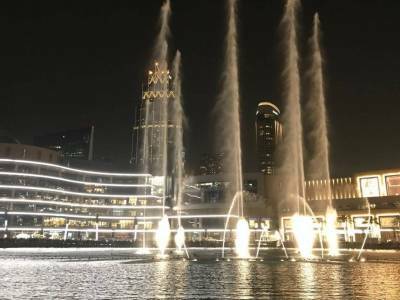 The fountain is equipped with powerful water shooter, jet streamers, robotic oarsmen and many more modern technologies that enable it to perform choreographed rhythmic water dance on different musical tracks from Arabic hits to world hits. The performance of the Dubai Fountain is most magnificent during the New Years when new elements like fire& crackers are included. The most popularly tourism activity here is a boat ride on the Lake to watch the Dubai Fountain perform all around. Fountains start at about 20:30 hrs local time every 20 - 30 minutes. 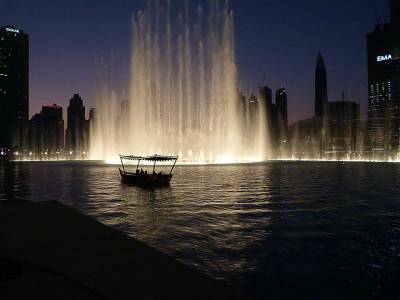 Get quick answers from travelers who visit to Dubai Fountain.